Hello everyone! I have the fabulous Meg of Henning Love here today to share some Thanksgiving Holiday Traditions with you. If you have not checked out Meg's lovely blog you really need to. Meg's blog is one I look forward to reading everyday. Her thoughtful posts, honesty, yummy treats, and beautiful DIY projects keep me coming back! So without further a due I give you Meg! She asked me to write about some Thanksgiving traditions that I had growing up or anything Thanksgiving related. Before I begin, I want to briefly mention that I love Hilliary's blog. Her recipes are amazing, I mean that tzatziki with couscous salad, I mean c'mon give me a huge spoon to dig into that! Ok onto my family traditions. First, let me preface by saying that Thanksgivings were usually just my immediate family since my dad was in the Air Force, so we didn't have the huge family gatherings until I was about in 7th grade when we lived near family. The food was pretty traditional, however, my mom did change some items a bit to blend into where we were living at the time. When we were in Japan, we might have used Japanese mushrooms and miso into a few of the items. Where they live currently, you will find my mom adding chipotles and other Mexican inspired ingredients into the Thanksgiving menu. Regardless of where we were living, I could always count on being active the morning of Thanksgiving, usually participating in a local turkey trot. Even when my parents started coming to my place for Thanksgiving, we still continue the tradition of being active. Whether it was a turkey trot or a bike ride, I could always count on that. Here are a few photos of the various Thanksgiving mornings from the last few years. Now that I'm married, I have been thinking about traditions that I want to have in my own family, what legacies I want to pass on to my own children. 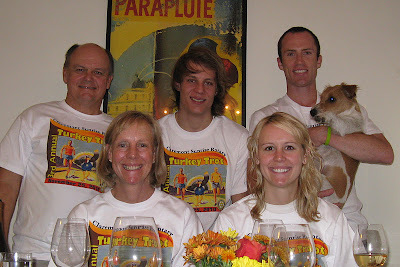 First, I would love to continue the tradition of a turkey trot (hey, that is what baby running carriages are for). I want my children to know the importance of working out, exercising and taking good care of your body. Second, the other tradition I would like to participate in either the week of Thanksgiving or the morning of Thanksgiving is helping out at the church that we attend with their Thanksgiving outreach or serving at a Thanksgiving dinner at a soup kitchen. I know my children to know the importance of volunteering, and giving back to their community. Another part of Thanksgiving is blending the traditions that I grew up with Sean's family's tradition. I have to arrange Thanksgivings that are a blend of what I am used to and what my husband grew up doing in his family. For me, the next way I can do that is to cook some of the items that my mother-in-law does for her Thanksgiving menu. Two of the items that I have included in my Thanksgiving menu that is from Sean's family is a cranberry salad called St. Tropez salad, and banana rolls or the Pillsbury crescent rolls. My husband loves those rolls so I buy them for him. Then in the evening of Thanksgiving, Sean's family always watches, Christmas Vacation, which is a great movie, there are too many funny scenes! The great thing about Thanksgiving is the blending of traditions and creating new traditions within my own family. These are just a few things that I love about Thanksgiving and the traditions my family and Sean's family grew up with and creating new traditions that Sean and I choose to create with our own future family. I hope all of you have a wonderful Thanksgiving, knowing how blessed you are wherever you are and thankful for the many awesome things you have in your life. Thank you again Hilliary for asking me to guest post! Awesome that you guys do a turkey trot. My mom is doing one this thanksgiving and it's her first race. I'm SO proud of her! :) Then we are running a race together in February. I hope you have a killer thanksgiving this year! I love Christmas vacation...that's a must see with our family!